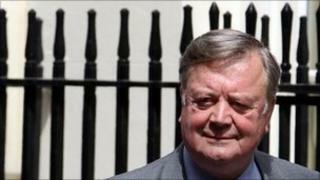 Kenneth Clarke has said he recognises the "appalling" treatment of Milly Dowler's family at her killer's trial. However, the justice secretary told the House of Commons the case does not alter an accused's right to a defence. Levi Bellfield, 43, was sentenced to a whole-life term last week after being convicted at the Old Bailey of murdering 13-year-old Milly, in 2002. Details of the Dowlers' family life were revealed by the defence during Bellfield's trial. Following the verdict, the family said it had been a "horrifying ordeal". Speaking at Justice Questions in the Commons earlier, Mr Clarke said: "It's quite obvious that members of the public generally were appalled by the experience through which this family was put. "These cases are exceedingly difficult because any defendant has the right to put forward a defence, however distasteful or distressing for victims it may be." Mr Clarke said trial judge Mr Justice Wilkie could have stopped Milly's parents' ordeal in the witness box if he thought it was irrelevant to Bellfield's defence. "The judge does have a discretion to cut out all irrelevant and unnecessary lines of questioning," he continued. "I have no reason to doubt the judge considered his discretion in this case," he said. Mr Clarke said the Crown Prosecution Service had applied for an order banning the reporting of some parts of the cross-examination. "I respect the decision of the judge who decided the open justice principle should prevail, and therefore it was all reported," he said. "It's useful to remind ourselves of just what an ordeal it can be when victims and witnesses have to go to court to face someone who is denying the crime." During the trial, Milly's parents, Bob and Sally, broke down in court after being cross-examined by Bellfield's barrister. Following the verdict, Mr Dowler said he and his wife felt like they had been put on trial. They said they had suffered a "mentally scarring experience on an unimaginable scale" and that they paid "too high a price" for the conviction.